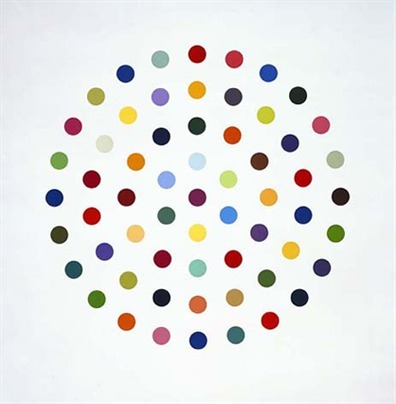 BEAUTIFUL DAMIEN HIRST, CINEOLE, 2004, This is a wonderful exciting SIGNED BY THE ARTIST LIMITED EDITION ETCHING, EDITION OF 145, DATE: 2004 Size approximate 45 1/4 x 44 5/6 inches Lambda print on gloss paper . Created by Artist Damien Hirst. Featured in several important published works on the artist. It is the RARE hard to find SIGNED Limited Edition features sophisticated brilliant color tones in this print, excellent! Made of the very Finest Archival Museum quality Excellent NEW MINT CONDITION is Highly desirable for collectors. This item selling in Upscale Art Galleries and Museum galleries when and if it can be found. This item is subject to availability. This is perfect for any elegant home, office, restaurant or place of business. WE CARRY SEVERAL DAMIEN HIRST Art works in our inventory. Death is a central theme in Hirst's works. He became famous for a series of artworks in which dead animals (including a shark, a sheep and a cow) are preserved in formaldehyde. His tiger shark immersed in formaldehyde in a vitrine (clear display case) became the iconic work of British art in the 1990s, and the symbol of Britart worldwide. He has also made "spin paintings," created on a spinning circular surface, and "spot paintings", which are rows of randomly colored circles created by his assistants. Click the button below to add the Beautiful Damien Hirst, Cineole, 2004 to your wish list.